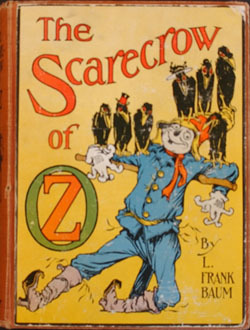 Cover of The Scarecrow of Oz (1915) by L. Frank Baum; illustration by John R. Neill. The Scarecrow in the Wizard of Oz had it right–of all things, the brain is what you should ask for. As you’ve read, I suffered a concussion 3 weeks ago. I’m only now just recovering, thanks to the amazing clinicians at HeadFirst. More on that later. It’s been frustrating, to say the least, coping with a traumatic brain injury, and trying to live my life of work, raising two kids, training for two half-marathons, and keeping up a social calendar. The symptoms were horrific, but the lack of understanding from myself, medical professionals and friends was also really difficult. When you say “concussion,” people often times assume it’s just a bad headache. Yes, it’s that–unrelenting for days–3 weeks in my case. But I was also so seriously nauseous that I couldn’t eat, fatigued beyond belief, dizzy and tipping over, and very sensitive to light. I felt like I was trapped in a fog, felt so slowed down, couldn’t concentrate or remember anything. It was like my brain was on “pause”–I literally could not think. I couldn’t recall words to have a conversation, despite knowing the concept in my head. I was really irritable (more so than my usual self–I know, it was ugly), and was so drowsy but couldn’t sleep. Miserable. Then it got worse. I went to see Jon Stewart with friends and a date. I know I had a great time, and Jon Stewart was very funny. Only I couldn’t remember any of his jokes, and I couldn’t recall chunks of conversation with my date. The amnesia terrified me. And still it got worse. Simply having a conversation with a friend to plan an evening’s activity was too much for my brain. After ending that 20-minute conversation, I promptly got lost in a building I’ve worked in for 13 years. I didn’t understand what was going on. I was getting frustrated with myself. I couldn’t control what I was saying or wanted to say. It felt like I was watching life unfold before me, and all I could do was watch through a foggy window. I felt dull and slow and not myself. But I kept pushing myself to lead my normal life, because it was “only a concussion.” Of course this made matters worse. I was also getting frustrated with everyone else. People see you physically standing there, well-groomed and alert. They don’t see the mess upstairs in the head (I’ve since been told it’s akin to shaking a snowglobe). They assume it’s just a headache, some mental fogginess. Get some rest they say. Oh, it’s just a concussion. No, it’s a BRAIN INJURY. Nothing about me is right. I was frustrated that people seemed so nonchalant about something so serious. To be fair, I also didn’t take it seriously the first two weeks. Through this experience I have come to understand the brain is who we are, regardless of what your beliefs are spiritually or otherwise, regarding your soul, heart, passions. It all starts in the brain. Your thoughts, your perceptions, your mood, your feelings, your impulse control, your reaction times. My brain is who I am. I panicked–I had to fix this. I couldn’t permanently be less than me, or other than me. I needed to be me! This is my only brain, it’s not a limb that breaks or requires a prosthetic, it’s not one of my two eyes, it’s not like I can get a cardiac implant like a pacemaker. So I am beyond grateful to have found such competent clinicians. There’s not a lot of research in brain injuries, but they’re on the forefront of education and treatment. I feel compelled to spread the word of both brain injuries (a concussion sounds so trite–let’s call it what it really is, a TRAUMATIC brain injury)–what they are, how they feel, how they manifest, how they’re treated–and of HeadFirst. HeadFirst provides education to medical professionals, schools, athletic teams, and the general public. They teach people what concussions and brain injuries are, and how to treat them. They also provide a very comprehensive evaluation using ImPACT (computerized cognitive test), a neurological exam, and clinical exam. ImPACT takes about 20 minutes and tests reaction time, problem solving, working memory, and some other cognitive functions I honestly can’t remember. The clinicians then provide a detailed treatment plan based on your symptoms and the test results. Gratitude does not begin to describe how I feel about these professionals. Not only for their expertise–they are the only ones I found in this area doing this kind of work–but for their compassion and support through this ordeal. I stumbled upon them from a friend who happened to notice their building. I firmly believe more people need to know about their services. They’ll come out to do educational talks for groups–call them! They’ll do baseline assessments for student athletes–call them! They’ll assess head injuries after a bump–call them! Fran is also very funny and is a yoga expert–don’t tell her I said call her, but if you do, tell her I said hi. She’s awesome. This entry was posted in Health Issues and tagged brain, brain injury, cognitive testing, concussion, head injury, HeadFirst, If Only I Had a Brain, ImPACT, Righttime, scarecrow, TBI, traumatic brain injury, Wizard of Oz. Bookmark the permalink. I’m so glad you are doing better!!! Concussions can indeed be serious, even with no bleed and no loss of consciousness. Cognitive rest, physical rest, etc., repeated testing using standardized measures, with gradual return to activities with increasing activity, in 24 hour intervals if symptom free…..this is all standard of care now. Good reminder that even for people with access to care, insurance, etc., getting the right care is not always an easy task. I’m so glad you eventually landed in the right place (pun intended). FYI, I recall seeing the statistics about the numbers of concussions in each sport, and I don’t think “trapeze” was even on the list!! Once again you have broken the mold!! I am so so glad that you have found some professionals that take this as serious as it should be taken and hope you continue to feel better each day. Take care of you. Thank you so much!! So sorry it’s taken me so long to reply! Some days still feeling a little sluggish!